Description - The size and coloration of this long-necked, slender duck vary between sexes. The larger male Northern Pintail duck has a brown head, white neck and underparts, a greyish back and sides and long, black, pointed central tail feathers. The wings are a metallic brown and green with white rear borders. The smaller female has a brownish head, grey bill and a somewhat pointed tail. The voice is a distinctive 2-tone whistle; the female quacks. Distribution - The Northern Pintail duck occurs throughout all of North America, breeding north of their local range and wintering south, sometimes as far as Central America and the West Indies. They prefer marshes, prairie ponds and tundra and may sometimes winter in salt marshes. 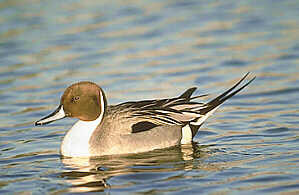 Biology - Awidespread and common duck, the Northern Pintail duck flocks in large groups of up to a thousand. Males are often aggressive, forcing their attention on females of other species. It is a grazer.